Michael Foight (right) presenting the award to Demian Katz (left). As part of the VuPop Popular Culture and Materials Conference each year, a worthy conference attendee is awarded a Lifetime Achievement Award for activities related to the preservation and scholarship of that specific material type. 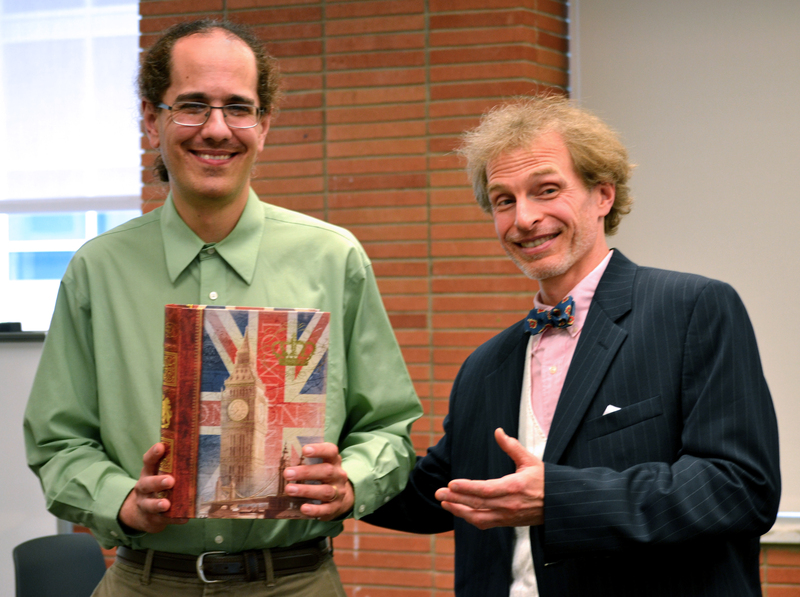 This year’s recipient is Demian Katz, library technology development specialist from Falvey Memorial Library. Demian is one of the world’s foremost acknowledged bibliographers and collectors of print interactive fiction and appreciated by gamebook fans all over the internet for Demian’s Gamebook Web Page, an international reference guide to interactive books, solitaire role-playing, and game-inspired fiction. Katz recently donated more than 2,500 print game books and other related materials to the Department of Special Collections at the University of California Santa Barbara. The Demian Katz Gamebook Collection (Mss 294) is now currently open for research using the Online Archive of California primary resource finding aid. For more information on this year’s VuPop conference, visit here. For more on the interactive fiction genre, visit here.